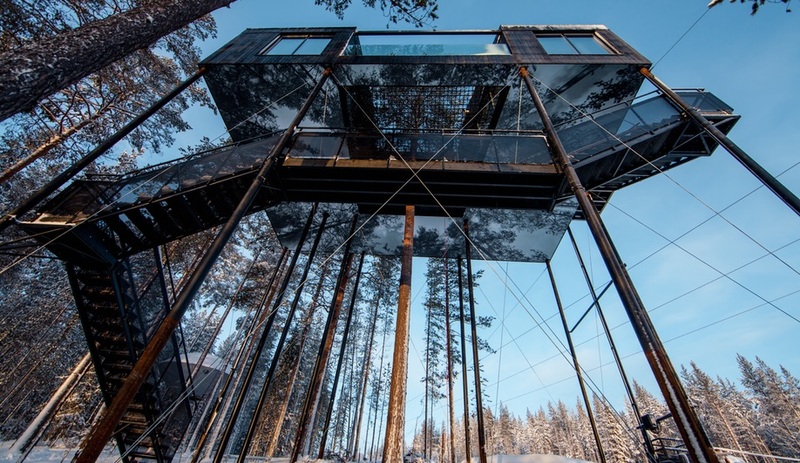 Snøhetta’s 7th Room is the newest treehouse at Sweden’s fantastic architourism hotspot, the Treehotel. 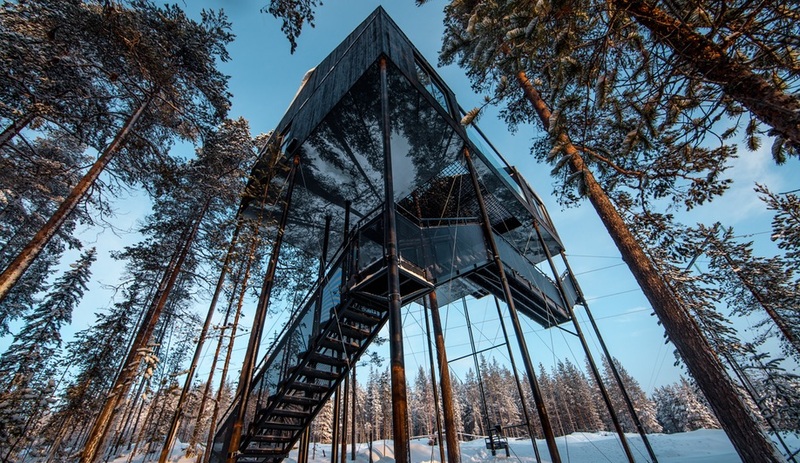 Sweden’s Treehotel is the ultimate getaway, combining childhood nostalgia with architectural appeal, stunning scenery and sweet solitude. 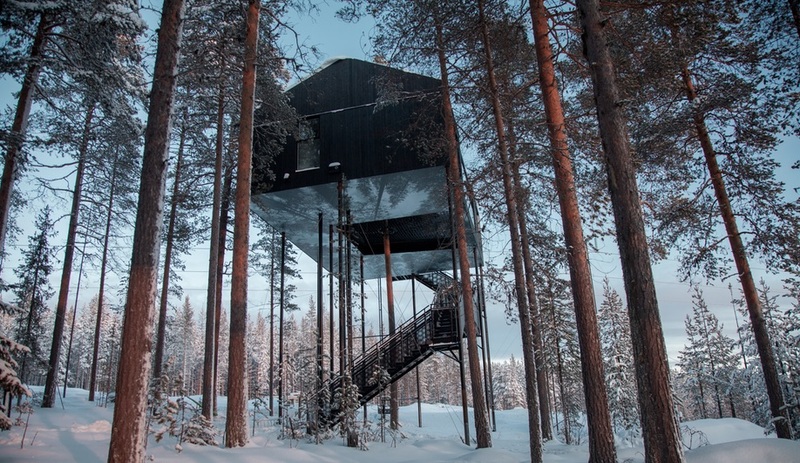 The idea of escaping to your own private hideaway, tucked up in the treetops, never loses its appeal, at any age. 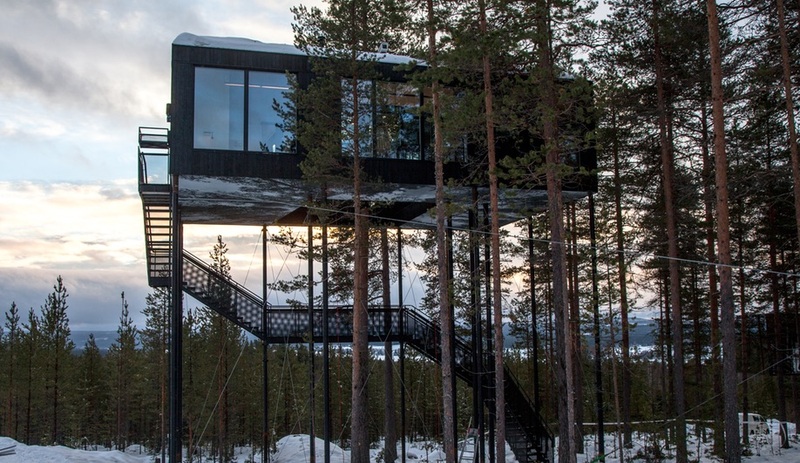 Owners Kent and Britta Lindvall have beautifully exploited that, forming a hotel around a series of treehouses – each with its own unique character – designed by talents such as Tham and Videgard Arkitekter, SandellSandberg, and now, Snøhetta. 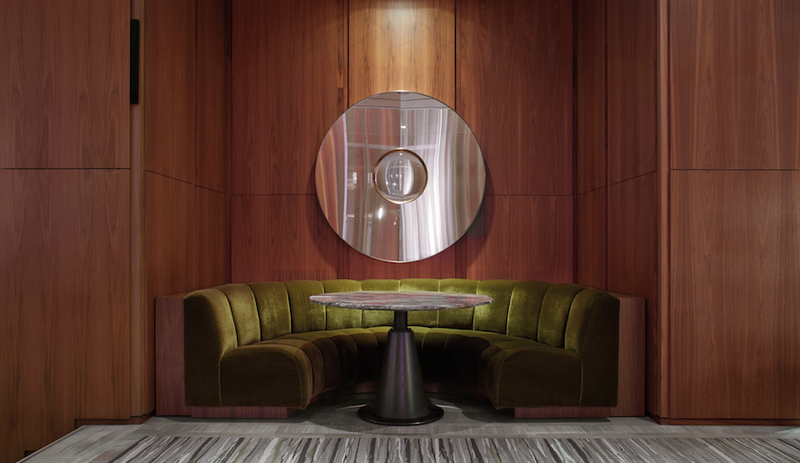 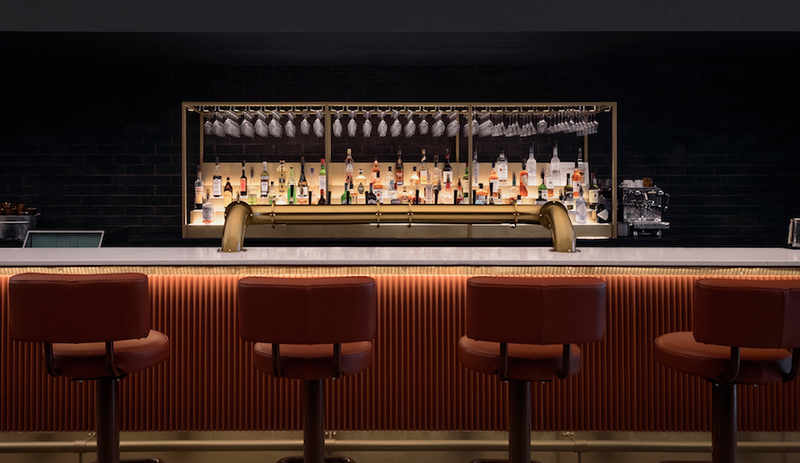 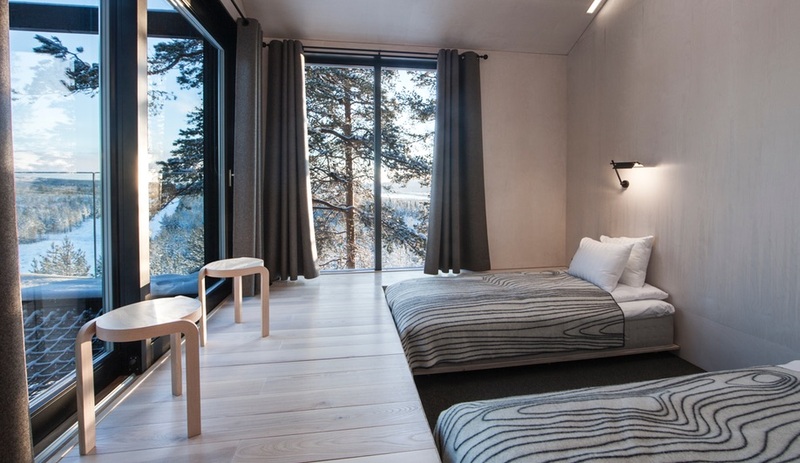 The Oslo/New York firm is the first non-Swedish office to design a room for the hotel; its 7th Room welcomed its first guests on January 18. 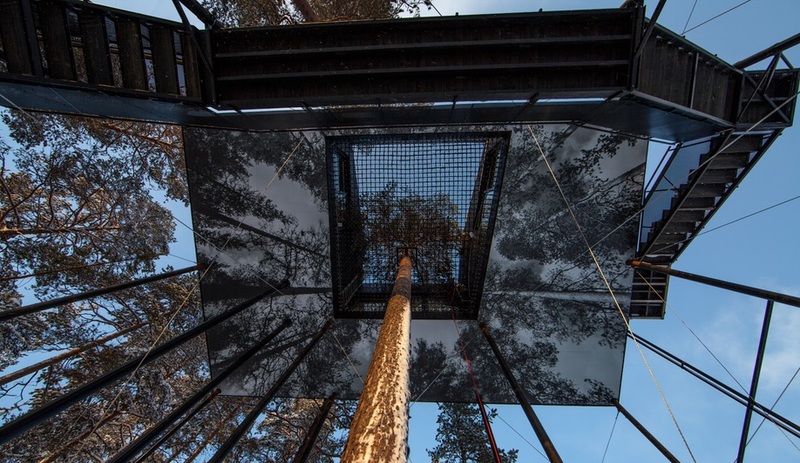 A treehouse presents a lot of room for an architect to play with, including on the extra facade – the underside. 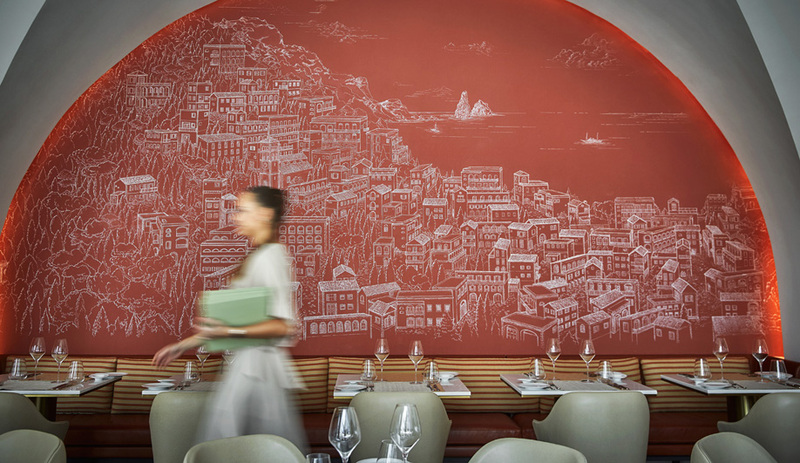 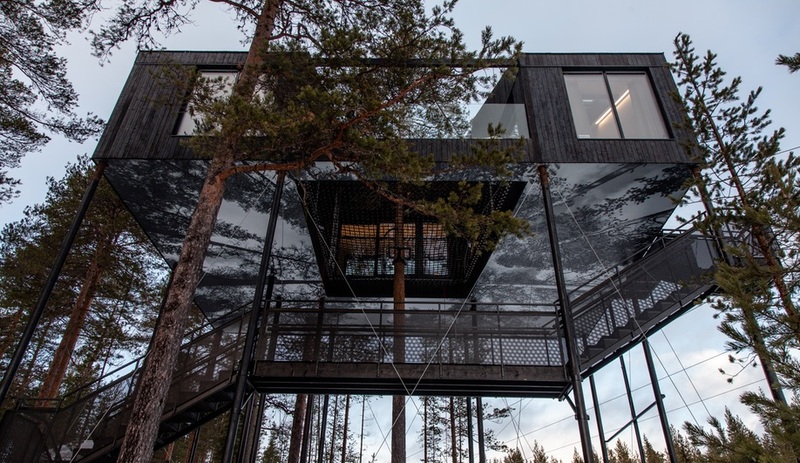 For the 7th Room, Snøhetta has clad this 12-by-8-metre surface with an aluminum sheet printed with a black and white mural of trees reaching upwards toward the sky. 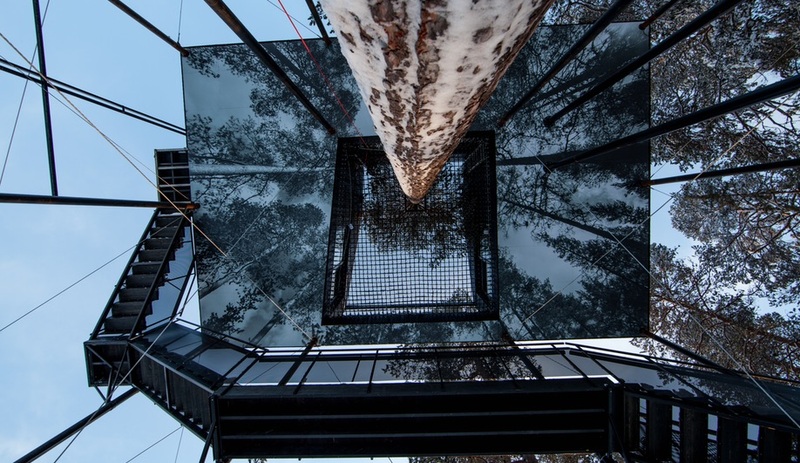 Standing in the snow beneath the black cabin, the image blurs into the evergreen canopy above, making the structure itself seem like a phantasmic apparition, floating through the Boreal forest. 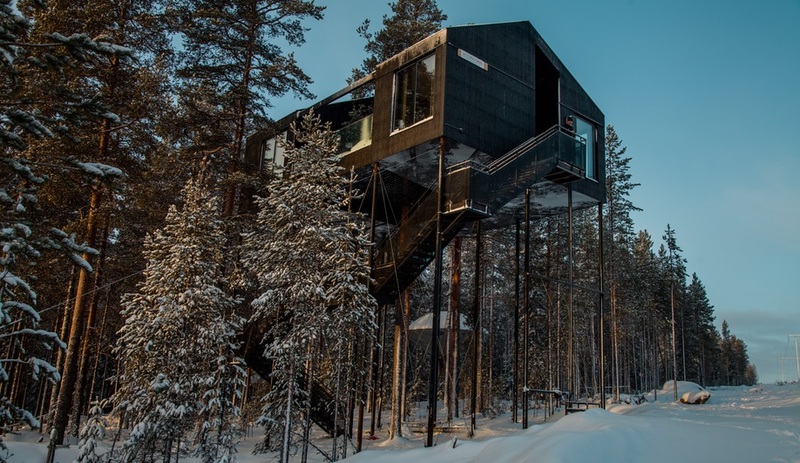 Modelled after a traditional Nordic structure, the pine exterior of the Snøhetta treehouse has been torched to create a blackened surface that better blends into the natural surroundings. 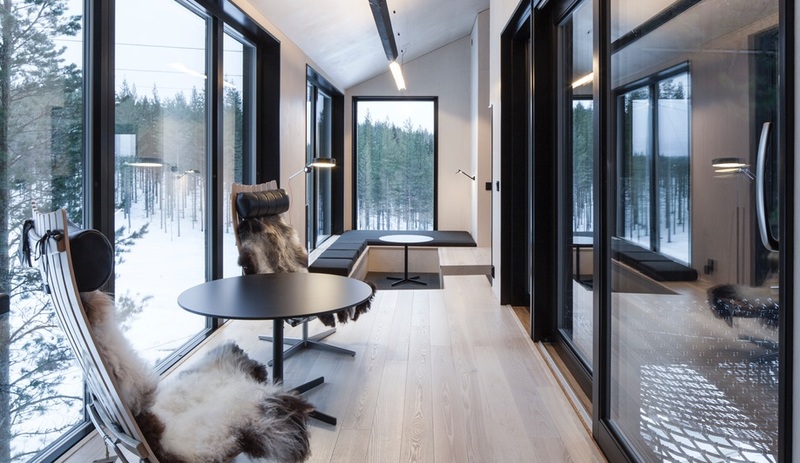 Accommodating up to five, there are two bedrooms, a cozy living room with a pellet stove, a bathroom and an “airy” terrace – a net-floored outdoor lounge area, hung at the centre of the cabin’s U-shaped formation and pierced through the middle with a soaring pine. 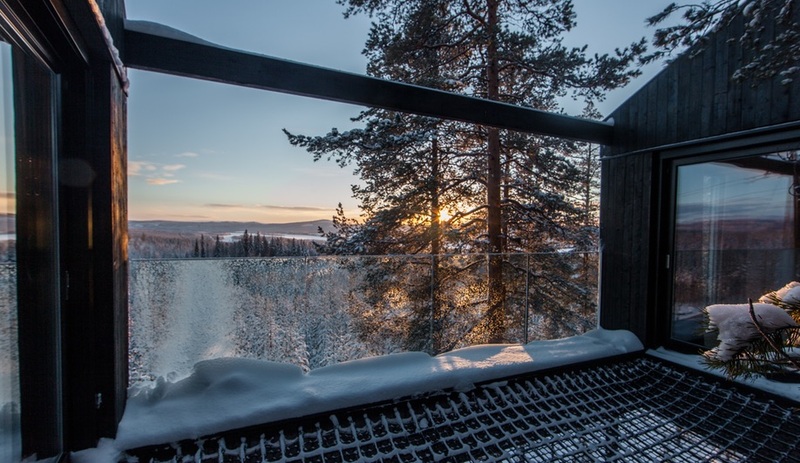 Perfect for stargazing through the trees, on a clear night guests can expect to enjoy the natural light show of the Aurora Borealis, from the lounge or from inside, through the floor-to-ceiling windows. 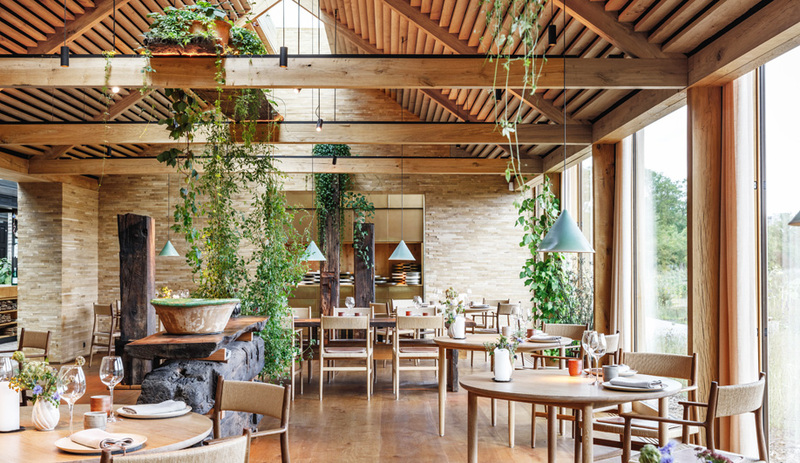 The light-filled interior is stereotypically Scandinavian, clad in pale wood – ash on the floors and birch for the walls and ceilings. 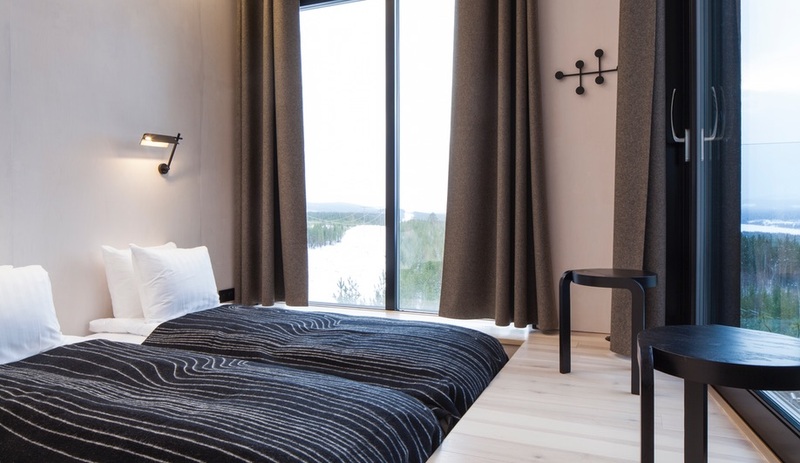 Skylights above the beds allow guests to keep an eye on the sky all night long.